Golden dorado are a fish of contrasts; pretty yet powerful, aggressive but spooky, brutal yet fussy at the same time. Perhaps it is this complexity that makes them so alluring. Based out of the comforts of the main Pluma Lodge and the chance of doing headwaters out-camps, anglers have access to three different rivers, each different and unique: the Pluma River, Itirizama River, and the lower Sécure River. This broad variety of waters and pools allow groups to fish fresh water every day, and rarely, if ever, repeat the same fishing beat. The water types very from deep pools to rugged terraced pocket water. The upper Pluma and Itirizama Headwaters Camps are a real paradise, located in the pristine headwaters of these two amazing mountain rivers. The camp operations are designed to offer entirely new sections of river each day. There are two different and established camp locations on the upper Pluma River (both comfortable African-style wall tent cabins), and two similar camp locations in upper Itirizama Rivier (one established wall tent cabin and the other a mobile camp). All camp locations offer chemical tent toilets, bag showers and a gazebo to be used as a living room. Nick Reygaert is the founder of Gin-Clear Travel. He has carved out a career as a celebrated fly fishing film maker for the last 15 years during which time he has travelled extensively in pursuit of the world's best fly fishing. Nick has had an obsession with golden dorado ever since he hooked his first one 14 years ago. He has travelled to South America numerous times in the last decade to tangle with these magnificent creatures. 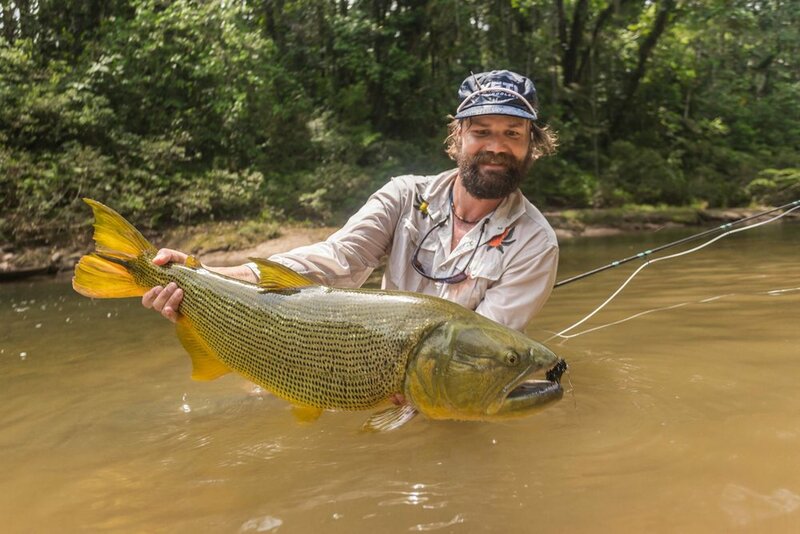 He relishes the opportunity to take hosted groups to sight fish the giant dorado of the Bolivian jungle. Day 0 : (June 28th) Arrival at Santa Cruz de la Sierra. Lodge representative will meet the group in Viru Viru International Airport. Transfer from airport to a five star Hotel in a double room (included in package). Day 1 : (June 29th) Breakfast at hotel. Lodge representative will pick up the group in the morning for transfer to local airport. Charter flight to the Asunta Indian Community (90 minute flight). 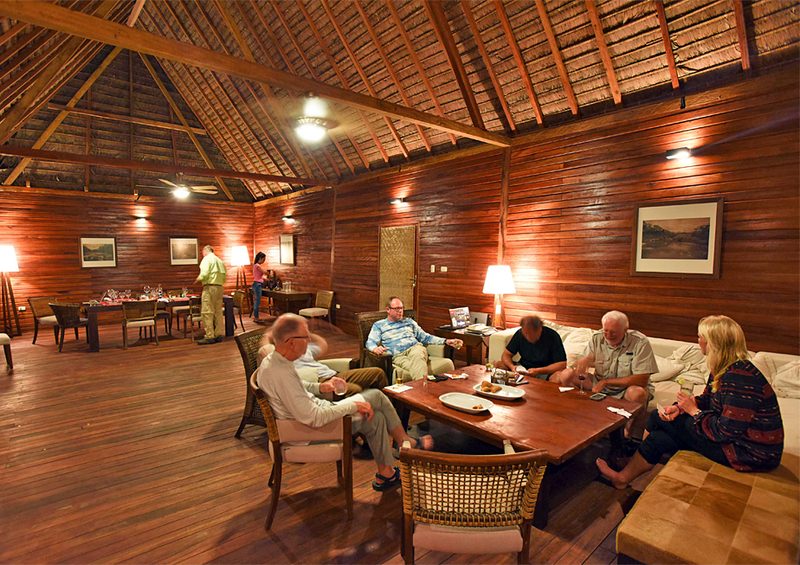 The guides will welcome the group upon landing, and transfer everyone to the Lodge. Half Day fishing follows. Day 2 - Day 7 : (June 30th - July 5th) Full days guided fishing and accommodation at Pluma Lodge. Day 8 : (July 6th) In the morning, guests will pack up and be transferred back to the Asunta Indian Community where you will meet your charter flight back to Santa Cruz. Transfer to the hotel to overnight (included in package). Day 9 : (July 7th) You will be picked up from your hotel by Lodge representative and be transferred to Viru Viru international airport for your flight home. — Francois Botha, Johannesburg, S.A. LODGING DETAILS: Even in one of the most remote places in the world, guest will enjoy the comfort and style of a world-class destination at Pluma Lodge. The main Pluma Lodge features four log cabins and sleeps up to eight anglers. Each cabin has spring box beds, private bathrooms with hot water and electric lights. Electric Power will be available from 6:00 am to 10:00 am and from 5:00 pm to 12:00 am. The lodge has laundry service available at no additional cost. FOOD & BEVERAGE: Breakfast is served at 7:30 a.m. with coffee, hot water for tea, varied fresh squeezed fruit juice, cereals with liquid yogurt, and a ham and cheese plate with toast. You can request cook to order eggs and omelets, usually served with bacon. Lunch is taken on the fly, packed in a cooler with icepacks and was everything from pasta salads, quiches, sandwiches, all in sizes you could hardly finish. Often they pack some fruit and always a bunch of packaged cookies, granola bars, and treats. The cooler is packed full of bottled waters (at least eight to ten per angler) cokes, sprites, Red Bull and beer. Dinner is always preceded by appetizers “Picado” (hot and cold, meats, cheeses, nuts, chips, olives, etc.) along with cocktails around the central coffee table and wrap around sofa. Dinner is served between 7:30 p.m. and 8:00 p.m. and is pretty formal with placemats, cloth napkins, nice silverware crystal wine glasses, water glasses, etc. Dishes included homemade ravioli, chicken, beef, pasta with vegetables, fresh baked bread and very tasty and sophisticated desserts. At the end of your week, the chef will cook an asado (barbeque) with beef, pork, sweetbreads on a wood fired grill, with salads and bread. All the camps/lodges have an open bar policy with most of the most popular brands of spirits. LENGTH OF STAY: The typical lodge package at Pluma Lodge is six (6) days of fishing. NON-ANGLING ACTIVITIES: Pluma Lodge is situated in a very remote part of Argentina, and overall, this is a fishing-focused operation. Not highly recommended for non-fishing partners. INTERNET/COMMUNICATION: Pluma Lodge has telephone and Internet services for guests although the internet speeds reflect its isolation. GENERAL INFO: The Pluma River is a moderately sized crystal clear freestone river, with an incredibly rich and beautiful topography. It runs from south to north, parallel to the Mosetenes Mountain Range, and is therefore slightly broader and more open than some of the other rivers. The Pluma is easier to wade due to its wide banks, mostly composed of round smooth gravel and rock. Further upstream, it does get steeper and more rugged. This river is home to all four of them main species targeted: Dorado, pirapitinga, yatorana and surubí. Omnivorous species such as yatoranas and pirapitingas are more and more frequent in the high sectors; the super- aggressive, carnivorous dorados are the dominant kings of the low sector. Upstream from the confluence of the Pluma and Itirizama Rivers is reminiscent of a trout freestone river, as it is full of boulders, shallow runs and riffles, and well-defined deep pools, all characterized by gin-clear water. In this sector, the fishing is done almost entirely on foot, walking and wading upstream. A canoe is used to carry additional gear and coolers and is very useful to row/pole back down to the Lodge at the end of the day. The high sector of the Pluma River is home to large number of resident dorados. These powerful fish are seen holding in most of the pools and pocket water, and are caught by sight casting using surface flies such as Titanic Slider, Poppers, Divers or using mice imitations (an exclusive bite for Salminus). The further upstream one goes, the more pirapitingas and bigger yatoranas are seen. This high sector of the Pluma has the type of water in Tsimane that gives anglers more chances to get a Grand Slam or Super Gland Slam, landing all of the primary Tsimane species. As an added bonus, we sometimes find paleta, an extremely rare and beautiful species of catfish. EQUIPMENT REQUIRED: Rods: We recommend 9-foot 7 or 8-weight rods. A quality fly reel is important. A strong, smooth drag is a must, as larger dorado are both strong and fast. Reels should have capacity for the fly line and 100 yards of 20-pound backing. Pack weight-forward tropical floating fly-lines (redfish, tarpon, and bonefish lines works well). Also consider “over-lining” your rods. For example, we often use a 8-weight floating line on an 7-weight rod, which has dual benefits: 1) It makes it easier to load the rod with less line and 2) the heavier line makes casting larger flies easier. Additionally, we recommend bringing a fast-sinking line such as Rio’s Leviathan (or similar), which has a 26-foot, 300- to 350-grain sinking tip. Intermediate tip lines are good options, too, including RIO’s General Purpose Tropical F/I. DO NOT bring conventional cold-water floating lines. Our tropical weather makes them soft and gummy and therefore difficult to cast. Leaders should be heavy enough to turn over big flies. Spools of mono should include 15, 20, 30, 40, 50 lbs, test weights. For floating lines you should have 9 foot long tapered leaders (Knotted or Knotless, depending on your personal preference). For sinking lines 4-6 feet of 30 lb. mono should work well in most conditions. Maxima Ultragreen Mono is a good option for leader material. An important thing to consider in a Dorado leader is the shock, or bite tippet. These fish have very sharp teeth that will cut even the strongest mono. Bring plenty of 20 to 40 lb test steel leader for your stay. Getting to Bolivia these days is relatively simple and painless with a wide choice of convenient flights via the US. 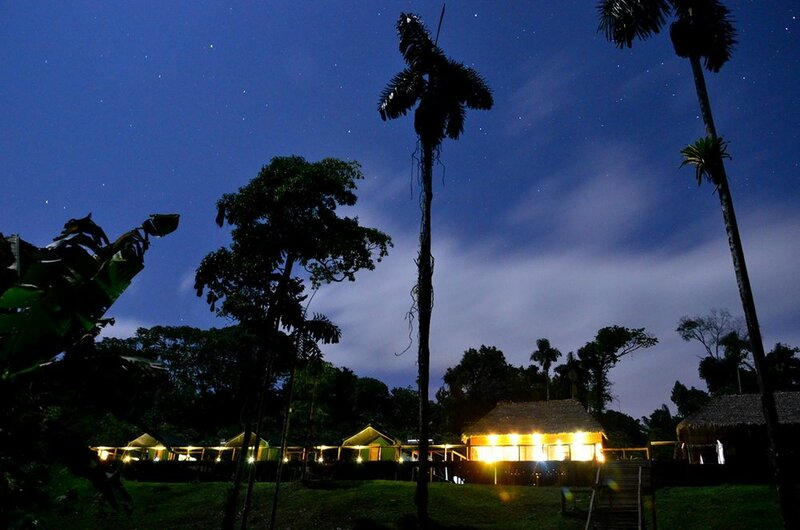 ARRIVAL & DEPARTURE DETAILS: The trip packages begin at Santa Cruz, Bolivia. So anglers must first get there. There are many daily flights from major cities world-wide. You will need a passport valid to 6 months past your departure from Bolivia. Once you arrive in Santa Cruz, a Tsimane Lodge representative will meet you and take you to the hotel (part of the package). The next morning you will be transferred to the airport for the charter ride to the first river. And from there you will travel by boat to the lodge. When departing, you will be taken again to the same hotel for the last night (also part of the package). The next day you will be transferred to the airport for your flight home. season runs from April/May through Mid October. WHAT'S INCLUDED: two (2) nights at a 5 star hotel in Santa Cruz, ground transfers in Santa Cruz upon arrival, charter flights from Santa Cruz to the Lodge return, 6 and half full days fishing with one pro guide and two local guides per two anglers, 7 nights lodging at Pluma Lodge, and all inclusive meals, beverages and spirits at the lodge & loaner fishing equipment (Rods, reels & Lines). $550 Indian Communities Fee payable in Bolivia). Native Community Tax: The Tipnis Natives (where Tsimane is located) have formed a board to protect their interests. This board includes representatives from all 22 Secure River Communities, as well as all the communities in State of Beni. The leaders of the association have made the decision to implement a significant user tax on all visiting anglers. The funds from the tax will primarily be used for social projects, infrastructure development, transportation, and medical and education projects.